Andrew Hayes and the rally team have been working to prepare the 2019 Rally experience for us. After a great deal of preparation work and developing the many possible opportunities to showcase the region and our veteran vehicles, the 2019 State Rally event is now finalised. It is certainly looking to be another great weekend of historic motoring! This month’s members’ Gathering takes on a more social and festive tone as we count down the days until Christmas. This month we have our end of year celebration, and I invite you to come along and celebrate the “VCCSA Christmas with a Caddy . . . AndPizza!” as part of our year’s end Noggin and Natter night. Building on the interest and delight shared by all when I displayed my Brush Runabout at this time last year, the Committee has invited Julian McNeil to share one of his more recent acquisitions with the membership. Come along and have a good inspection of his vehicle that will be on display in the car-park while you indulge in a selection of pizzas and wine provided by the Club. 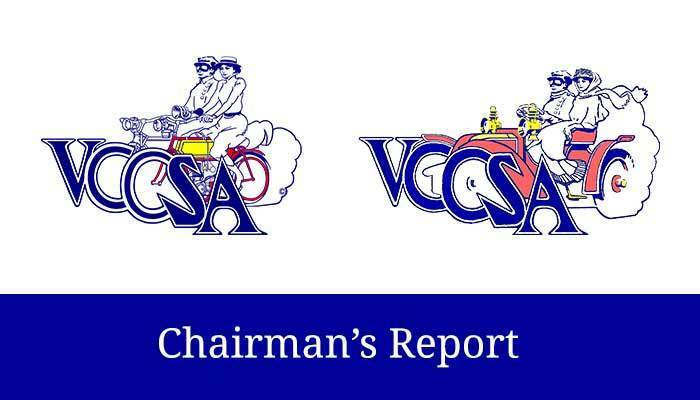 As we head to the end of the year, I would like to offer my thanks to the Committee of the VCCSA for their continued efforts to support and grow the interests of the historic vehicle movement and advocate for our right to enjoy our significant veteran vehicles on the roads and have a lot of fun in the process. I thank the members for your continued patronage at monthly Gatherings and participation at events, runs and our two weekend rallies. You are the backbone that make our veteran motoring enthusiasts club what it is. Merry Christmas and best wishes for the approaching festive season.